I remember wanting to like Voyager a lot more than I did. The first episode showed some promise, but I remember being disappointed with the first season. Looking back, I can see I was equally disappointed by the first Star Trek movie and the first few seasons of Star Trek: The Next Generation. Midway through the series, my first child was born, and I moved from Canada (where I had been attending grad school) back to the US in order to accept my first full-time job. In our new house we did not get whatever TV station carried Voyager in our area, and we chose not to bother paying for cable. While my sister regularly sent us videotapes with episodes of MST3K and Babylon 5, for whatever reason I never asked her to send me any Voyager. I’ve spent more time over the years looking at the blueprints for the soundstage where all the Star Trek shows were filmed than I have thinking about any specific episode of Voyager. Nevertheless, I enjoyed reading this fan’s recollection of what Voyager meant to her. The “seeing yourself on screen” thing is a cliché, but it really is important. It’s not just seeing people you can relate to, it’s seeing people you can relate to being successful. That’s the empowering part. That’s what Star Trek: Voyager meant to me. And that’s not all it meant to me. Everything I know about being an engaged fan, I learned from Star Trek: Voyager. That show wasn’t the first thing I had been a fan of, by any means. I’m pretty sure The Chronicles of Narnia as a kindergartner take that honor. But it was my first fandom. 16 Jan 2015 in Culture, Essays, History, Personal, PopCult, SciFi. ← Writing School Papers: Does Your First Version Say It All? Capt. Janeway is still my favorite. I was seven when the show was first released. It didn’t take long for it to be syndicated. I remember watching a lot of reruns in the middle of the day on weekends. Kristen K. Tunney liked this on Facebook. Tyson Boucher and me are watching it together via Skype tjese days, and parts of it hold up surprisingly well. 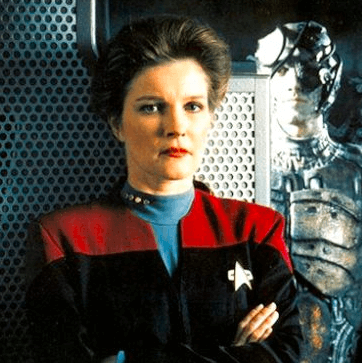 Janeway’s Rules for Life: Keep your shirt tucked in, Go down with the ship, and Never abandon a member of your crew.